What happened on the day when the big one hit the earth millions of years ago? Most likely, life was going on as normal. And then, in an instant, a meteor impacted the Earth so hard that it affected the entire atmosphere, creating a fiery, ash laden sky. Thus wiping out all of the giants. This coming Monday the 21st, mid-day, there will be another cosmic event – the Solar Eclipse. Eager spectators, along a certain path in the United States, will view it because it is so rare. The last time it happened in the US was in 1979. The next solar eclipse won’t happen until 2024. It won’t be an extinction level event, but it is dangerous to view it with the naked eye, so please be careful and use proper viewing gear when you look up. This dinosaur is on alert. Is there a T-Rex on the prowl? I did this illustration in watercolour medium. It was fun to do because of all the sandy texture that had to go into it. I wanted to capture the footprints as if they were made recently, hence the sharp nail marks and defined foot pads. These track imprints in the sand belong to an Allosaurus, or a bipedal theropod, from the Late Jurassic age. The Allosaurus is a carnivorous dinosaur much like its cousin the Tyrannosaurus Rex. All theropods had bird-like clawed feet although their legs were very strong and muscular to chase prey down. I am ecstatic to see that the Jurassic World movie is featuring the massive underwater dinosaur, the Mosasaurus. The Mosasaurus was the alpha predator in the late Cretacious age and it makes today’s great white sharks look like teddy bears in comparison. 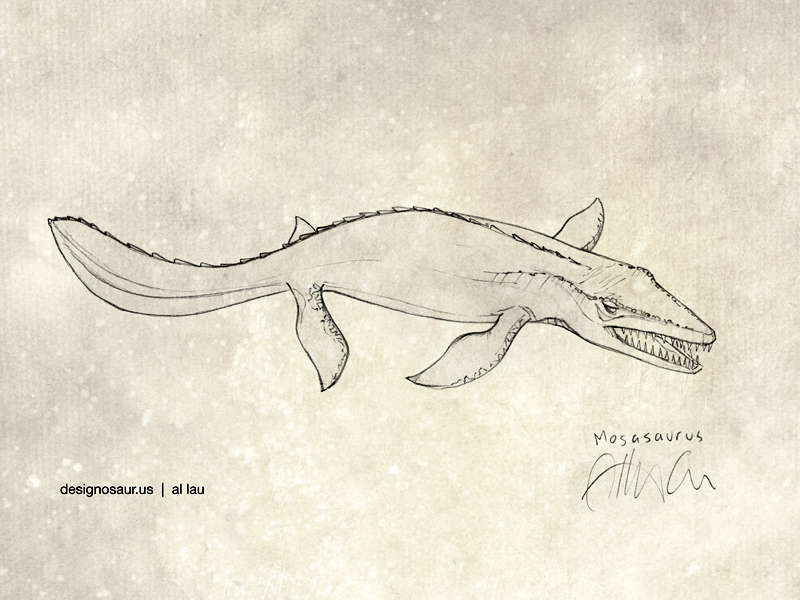 This is my drawing of a Mosasaurus. I hope to make it look more menacing, next time. 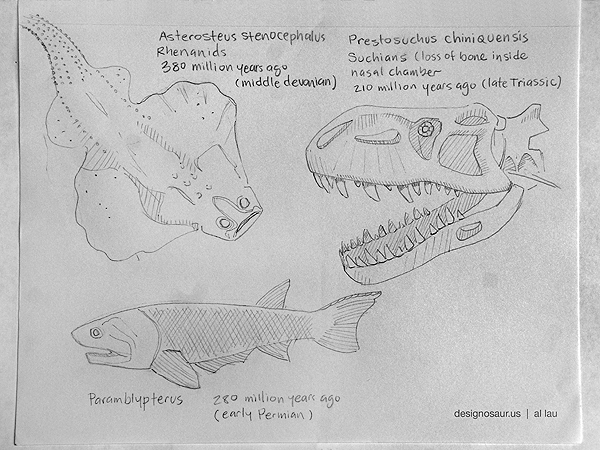 Ichthyosaurs first appeared in the Triassic age, then flourished during the Jurassic up to the Cretaceous. 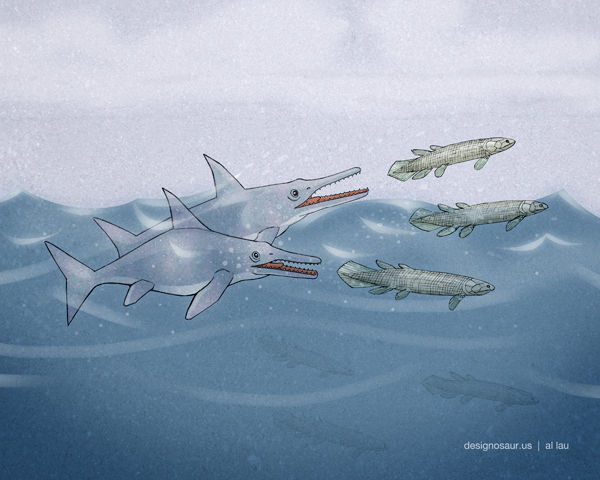 Ichthyosaurs are an early relative of today’s dolphins – built for speed and equipped with razor sharp teeth. In my artwork, it is a prehistoric “dinner for two” as I display them in hot pursuit for a school of fish.